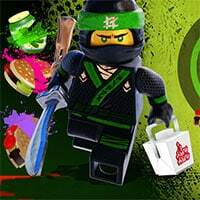 Spinjitzu Slash: Help Llyod from Ninjago clear out his refrigerator in Spinjitzu Slash. Destroy pizza, expired milk carton, and more as the master the awesome power of Spinjitzu. Carefully slash at food, but avoid green hexagon pendant. Nya vs. The Shark Army: Battle through waves of Shark Warriors to reach the ultimate showdown with Garmadon. Flight of the Ninja: Use the power of Jay’s Ninja Launcher to fly through the sky, collecting as many coins as you can. Target Practice: Use your arrow flinging skills to take down Garmondon’s army – but watch out for civilians. Kai-Chi: Achieve the ultimate state of fearlessness as you follow Kai’s lead, learning the art of Kai-chi. Whack a Shark: Use Cole’s hammer to whack as many Shark Warriors as you can before the time runs out. Ninjago Ninja Training Academy is a free online action game on Round Games.